Changes to the Home Equity Conversion Mortgage (HECM) program over the last couple of years are making reverse mortgages more attractive to outside banks and credit unions interested in growing their umbrella of products and services. And some industry members are taking on certain strategies to bring these institutions into the reverse space. In an industry like financial services, which is constantly under the microscope from regulators, staying compliant with regulations and avoiding reputational risk is critical and can often serve as a barrier to adopting new products. HECM changes in the last few years such as the Financial Assessment, the elimination of the fixed-rate HECM Standard and limiting the amount of proceeds borrowers can draw in the first year of the loan, have improved the reputational risk that several of the industry’s biggest banks cited in their reasoning for leaving the reverse market in the past. “The reputational risk is significantly less after the implementation of Financial Assessment, the HECM product is being seen differently now,” said Wendy Peel, vice president of sales and marketing at ReverseVision. And this newfound sentiment toward reverse mortgages has translated into greater interest for the product from a wholesale standpoint. In 2014, Peel notes that ReverseVision Exchange (RVX) added over 800 new broker companies to the system with 2015 showing similar growth patterns—this push has led to approximately 60-plus different banks and credit unions that have entered into the space as brokers and/or lenders. The company’s inquiries from regulated institutions have also taken a sharp increase as well in 2015, Peel noted. The heightened interest is being driven by a need to not only expand product offerings, but also to retain clients who are interested in getting a reverse mortgage without forcing them to have to look elsewhere. “As we’re talking with banks, they are interested in the entire aspect of how this works with lending and serving their customers in the same umbrella, and not letting their customers leave that umbrella,” Peel said. From a technology standpoint, ReverseVision aims to further ease the transition of banks and credit unions into the reverse market through its data security component to help institutions eliminates barriers to staying compliant. There is a huge opportunity in growing the reverse mortgage market by extending HECM reach into the traditional “forward” mortgage world as a whole, says Kim Smith, senior vice president of wholesale lending at American Advisors Group (AAG), which along with ReverseVision has partnered on increasing education efforts aimed at attracting outside institutions to the reverse market. “It’s a strategy we’ve committed to and one that we’ve put resources behind,” Smith said. 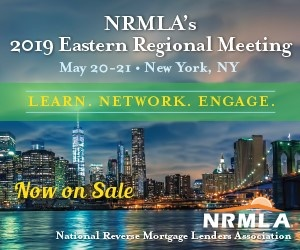 This includes targeted marketing efforts to speak with banks, including prospecting and viewing regional bank conferences as an opportunity to connect with key decision makers who can move the ball forward on product adoption, Smith said. But talking to other banks and providing education to them is lengthy process too, especially as of late. With the long-heralded TRID (TILA-RESPA Integrated Disclosure) rules taking effect October 3, preparations for the upcoming rules have consumed much of the time, energy and resources of many lending institutions—leaving little growth for rolling out new products. Nonetheless, an interest remains. The Financial Assessment may even be enough to simply pique interest in the HECM product. In fact, minutes before this interview, Smith had been on the phone with a bank in North Carolina who wanted to understand, what they referred to as, the “safeguards” now in place with reverse mortgages. “Banks especially want to offer products they feel are safe, and I think the reverse mortgage changes have made this a product they are going to be more comfortable with,” Smith said. But while some banks might be starting to come around to reverse mortgages, talking with the right people so they can truly understand the HECM product is still a critical process that needs to take place.